Took to the Marlborough this morning with Hera. It was cool first thing, about 6 degrees Celsius. I passed by two hunters driving out on my way in to Lester’s Square. 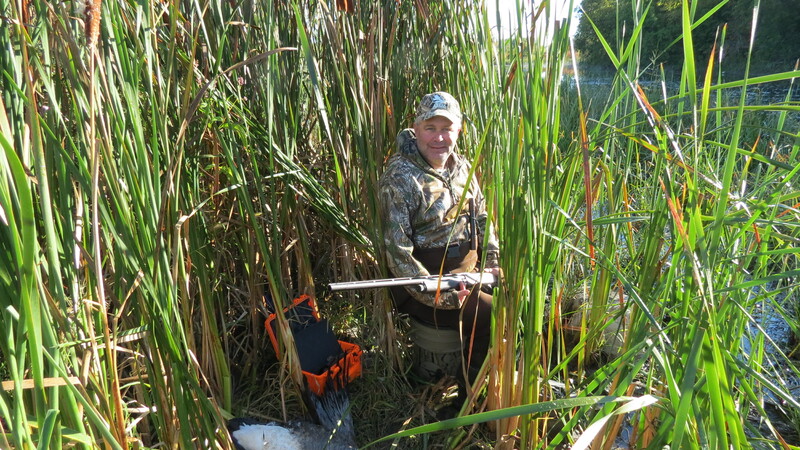 I started the hunt at about 8:30 am with my trusty Winchester 20 gauge side-by-side. Woodcock covers are dry still. Hera pointed a woodcock in the cedars on the ridge that leads to the meadow and edges we hunted next. I walked up the point and the woodcock flushed. I darted to get in position for a shot, but fired just as the woodcock dropped from view. My first miss of the season, but on a staunch point. Hera pointed once more in the middle hedgerow in the meadow, but there was no bird. I think it might have been a running grouse. She was staunch on point again. On the drive to Cowan’s Corner, I came across the hunters I passed on the way in. They had an English pointer, full male, and were European. They reported putting up two woodcock this morning. They commented on the dryness in the woodcock covers too. We need a good rainfall in the next week to moisten the covers for migrating woodcock. I took a drive up the trail at the E7 entrance into the Marlborough, hoping to find another patch of cover showing promise for grouse and woodcock. I saw people on trail bikes and all terrain vehicles on the trail, something to be mindful of when you are hunting with a dog. I stopped and parked on the trail at a spot that looked very promising. 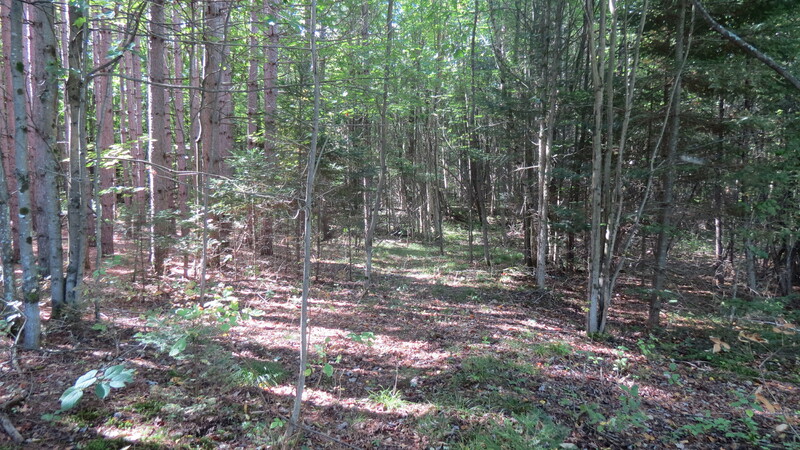 An edge habitat consisting of hedgerows with hardwoods, shrubs and a few cedars near the trail. I got out and took Hera, intending to sweep the hedgerows. However, as I reached the end of the first hedgerow, I found a gate with a sign reading “private property keep out.” To my credit, the spot where I entered the area is not posted; it was an honest mistake. We beat a hasty retreat, nonetheless. I drove further along the trail, but found most of the forest in the area is dense cedar and pine. It is not the best habitat for upland gunning. I turned back and parked along the trail that runs parallel to the old quarry where people used to go for target practice. There is a nice edge along this trail that often holds a grouse or two and the trail leads to the marshy end of the Ducks Unlimited pond situated along the E7 trail. I hoped we might turn up a Wilson’s snipe or woodcock in the boggy earth at the marshy end. Also, the temperature rose steadily as the morning wore on. By 11:00 am it was about 20 degrees Celsius. When we reached the marshy end of the pond, Hera could cool off in the water. As we made our way along the trail there were no points of flushes. I spied a spend 20 gauge shotgun shell on the trail and Hera found the remains of a hare someone shot and dressed on the spot. 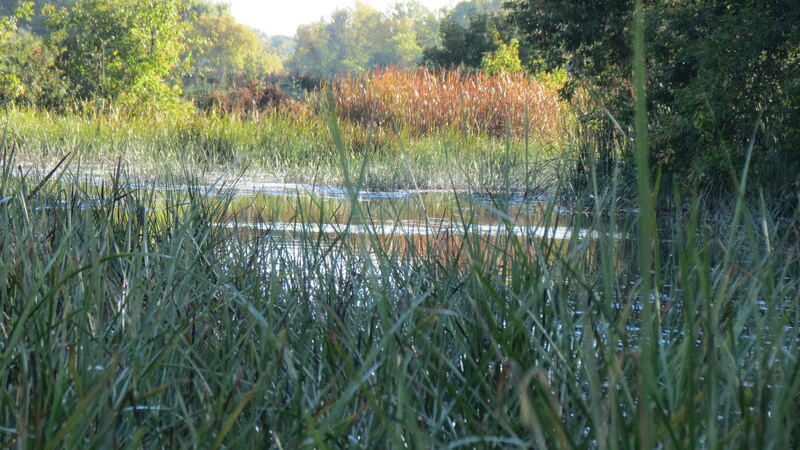 We reached the marshy end of the pond and sure enough, the ground was boggy. There was water for Hera to cool off in too. We made a sweep of the loosely scattered cedars and shrubs hoping to find a bird, but turned up nothing. We made our way back to the car, it was 12:15 when we got back. I gave Hera a drink of water once she was back on board and had a drink myself before we called it a day and headed home. It is early in the season yet and I sure hope the forest gets a good, drenching rain before Thanksgiving Weekend. 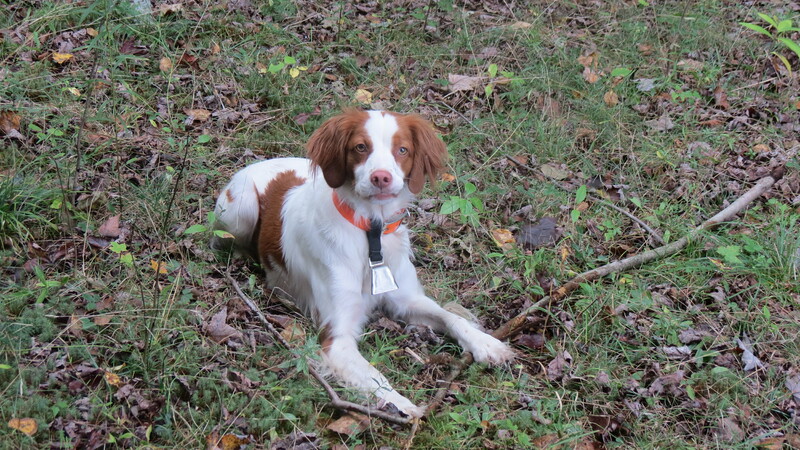 This entry was posted in Brittany (dog), Gun dogs, Hera, Hunting dogs, Pointing dogs, Ruffed grouse hunting, Small game hunting, Upland bird hunting, Woodcock hunting and tagged 20 gauge, autumn migration, Brittany (dog), Brittany Hera, coverts, grouse, Lester's Square, Marlborough Forest, Ruffed grouse, woodcock hunting on September 27, 2015 by geoffreyandmika. 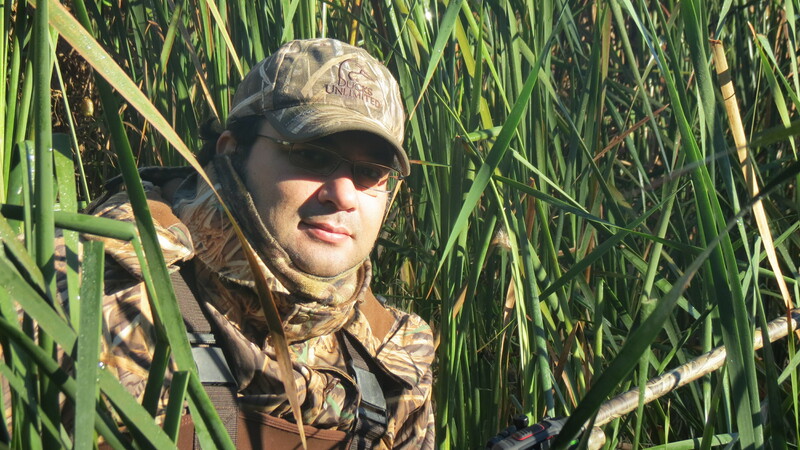 I remember many years ago meeting someone who referred to ruffed grouse as “ruffled grouse” to which I quipped, “I’ve know a few grouse to be ruffled.” I was thinking of this moment on September 20, 2015, day two of the small game season in Eastern Ontario. I got up at 0700, had breakfast and made ready for a morning hunt for ruffed grouse and hares with my friend and hunting buddy, Jason Quinn. 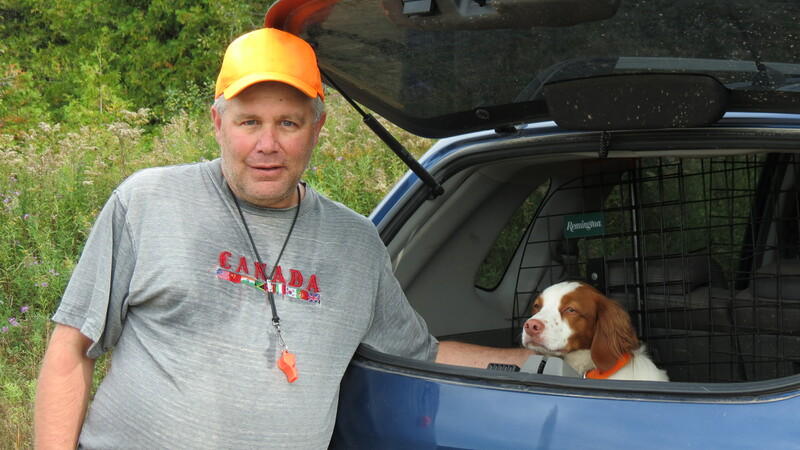 The weather was near perfect for an early season hunt in the uplands; it was sunny and cool, about 11 degrees Celsius, with a light northwest wind. Hera was excited when she saw me bring up my upland hunting gear. 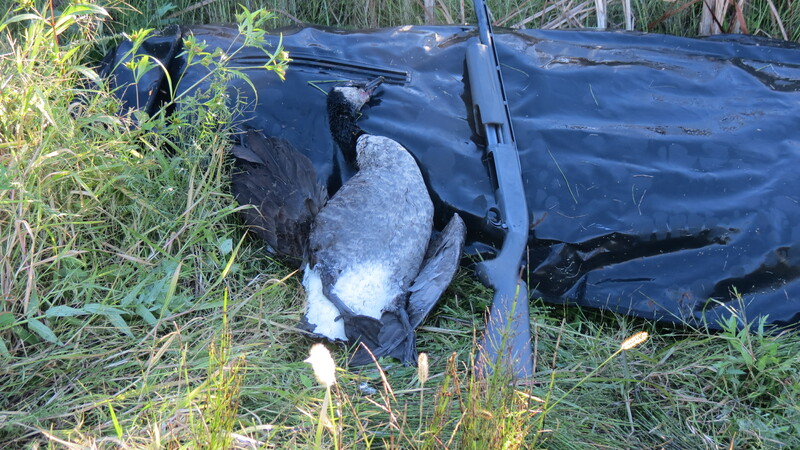 I brought my Winchester 20 gauge double barrel (side-by-side) for the morning hunt. The first time I brought it into the field following a repair to the stock. 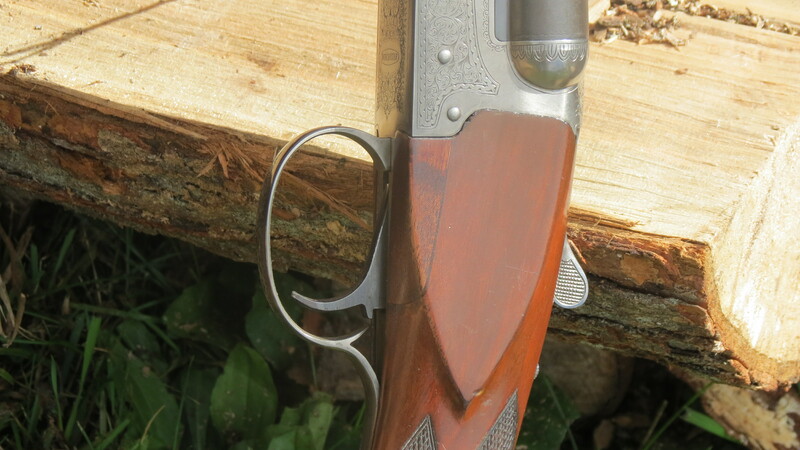 Jason Spencer, a local gunsmith I turn to for maintenance and repairs to my guns, skillfully replaced a piece of the stock that got knocked out the season before. I got to Jason’s house shortly before 0800 and when he put his gun, gear and dog Nos on board, we got underway. It is about a one hour drive from his house to the property near Spencerville we hunted this morning. We stopped to grab coffee and fuel en route. The morning’s hunting expedition had a second objective. We combined an upland hunt over our dogs with preseason scouting for deer season, checking on two trail cams Jason set up earlier in the year and to add two new ones I purchased. Also, we were looking for a new location for my deer stand. Its current location is on a ridge in a patch of crown land. It is a great location, save for the fact a group of deer hunters has a camp on the same patch of crown land and we were getting in the way of each other at times in hunting season. Our aim this morning was to find a site on the private property to which we have access for hunting. We got to the property shortly after 0900 and set out with the dogs, walking a familiar trail. I was pleased to find the ground nice and moist with pools of water in places. This bodes well for the woodcock season that opens a little later in the season. The dogs took to the covers, enthusiastically quartering and searching for game. 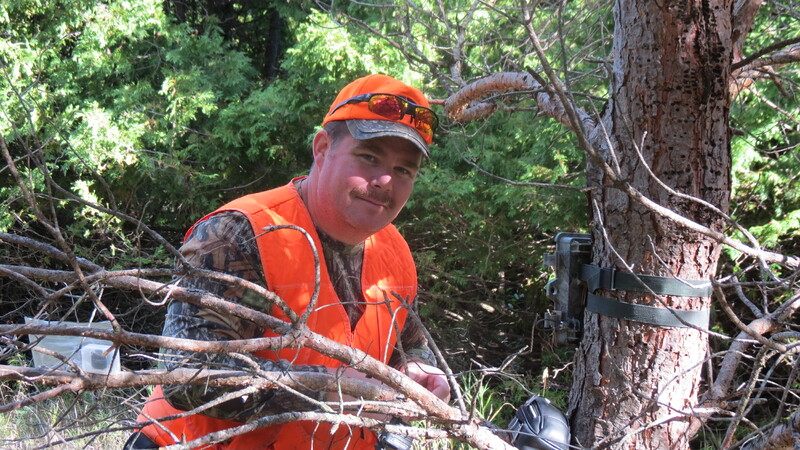 We arrived at the spot where Jason placed the trail cams and he checked to see what, if anything, was caught on camera. The cameras captured a cavalcade of animals, birds and people. Bucks, does, fawns, turkeys dusting, hares, a coyote, raccoons, roaming dogs from the neighbour’s property, trespassers and the owners of property were caught on camera. The deer and turkeys interested us most. Deer were seen moving through the area day and night. It was good to see there are deer moving through the property. 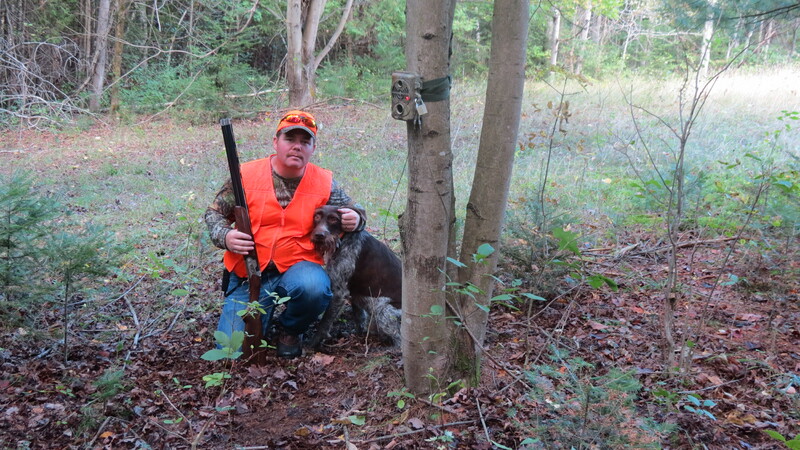 Once we were finished with the trail cams, we moved on with the dogs, continuing the morning hunt. As we neared the swamp at a corner of the property we bumped a woodcock. Woodcock season opens later in the week, so we watched as it made a hasty exit. A couple of moments later we bumped a Wilson’s snipe closer to the swamp. We watched as it made itself scarce too. I hope this is a taste of the season to come. We swept through the patch of cover that leads to where Jason’s deer stand is located. This patch of cover often holds a grouse or two. Though the dogs swept the cover, there were no points and no wild flushes. We checked on Jason’s deer stand, finding it in order and continued to the stand of pines that marks the border of the property and the crown land on which my deer stand sits. We looked over the area and found a suitable spot to relocate my stand, putting it firmly on the property to which we have permission to hunt. It is a patch of lowland where the pines, hardwoods and meadow meet, an edge where I saw deer crossing in seasons past. Jason set up a one of our two unused trail cams to watch the area and see if any deer come and go between now and the opening of the rifle season in November. 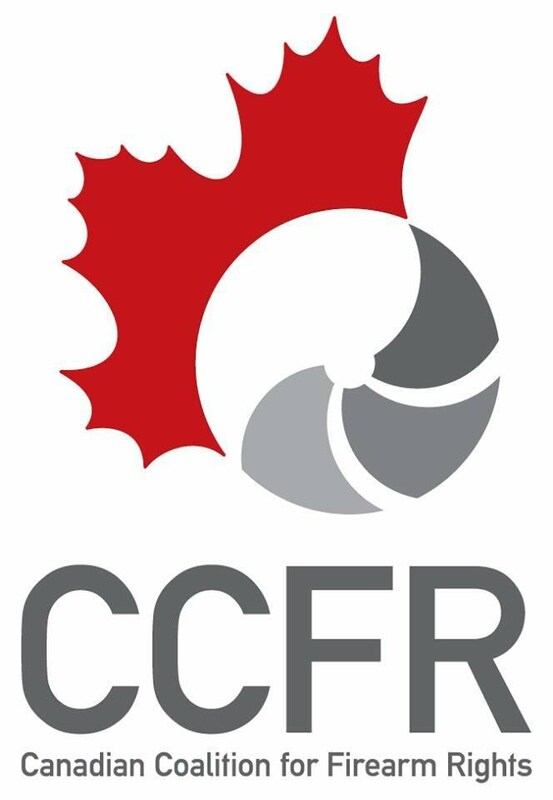 I feel much better that my deer stand will be firmly on private property and hopefully well away from the hunters and their camp back on the crown land next to it. The new site puts me in a quarter of the area where Jason, his wife Fran and our hunting buddy Omer have their stands placed. We have the area well covered now, which should put us in good stead for one of us to bag a deer this season. We set up the remaining trail cam to watch an area between Fran’s and Omer’s stands where deer passed in previous seasons. Once this was done, we worked our way back to another corner of the property hoping to turn up a grouse. We heard a grouse drumming somewhere in the distance, but there were no points or wild flushes. When we arrived back at the car it was close to 12:00. Though we did not turn up any grouse or hares, the dogs had a good run, we checked on trail cams already in place, found a new site for my deer stand and set up two more trail cams. It was a good start to the season. 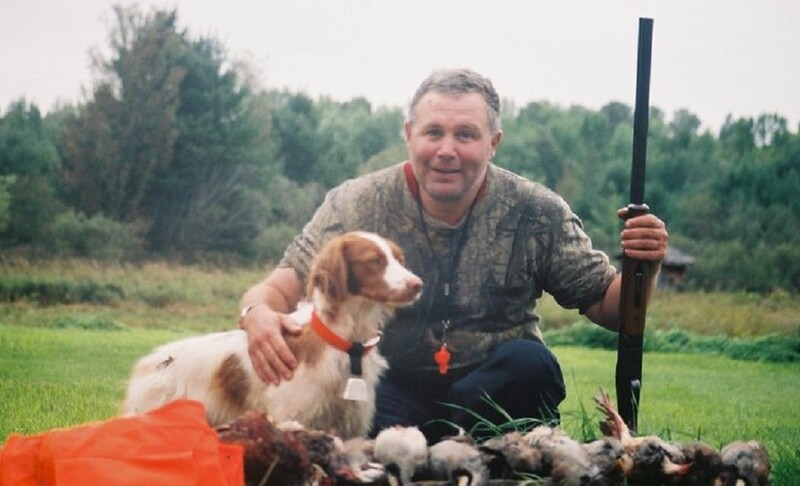 This entry was posted in Brittany (dog), Gun dogs, Guns, Hera, Hunting dogs, Pointing dogs, Ruffed grouse hunting, Small game hunting, Upland bird hunting, White-tailed deer hunting, Wildlife habitat and tagged 20 gauge, Brittany (dog), Brittany Hera, German Wirehaired Pointer, German Wirehaired Pointer Nos, Gun dog, Jason Quinn, Ontario, pointing dog, Spencerville, trail cam, Wilson's snipe, Woodcock on September 22, 2015 by geoffreyandmika.